Throughout his career with Reprise Records, Sammy Davis, Jr.’s focus in the recording booth was on creating solid LPs, largely eschewing more novelty material in favour of a repertoire pulled from the Great American Songbook, and, more often, the Great White Way. 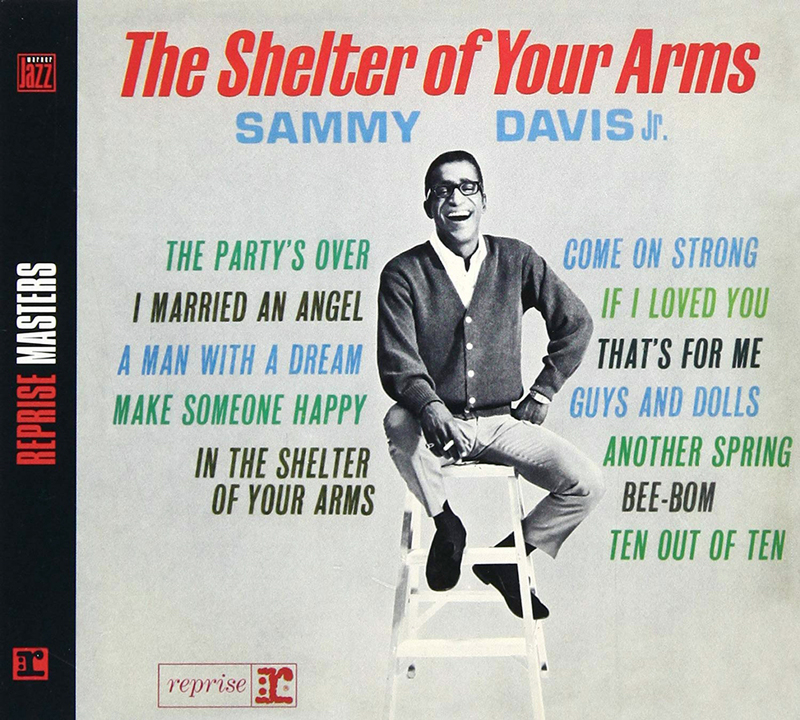 A notable exception to this approach was “The Shelter Of Your Arms”, a solid pop tune with a more commercial sound, aimed squarely at radio play. It was part Bacharach, part Mancini, with a syncopated bass line, chimes, bells and a female chorus, and all glued together by Sammy’s strong earnest vocals. 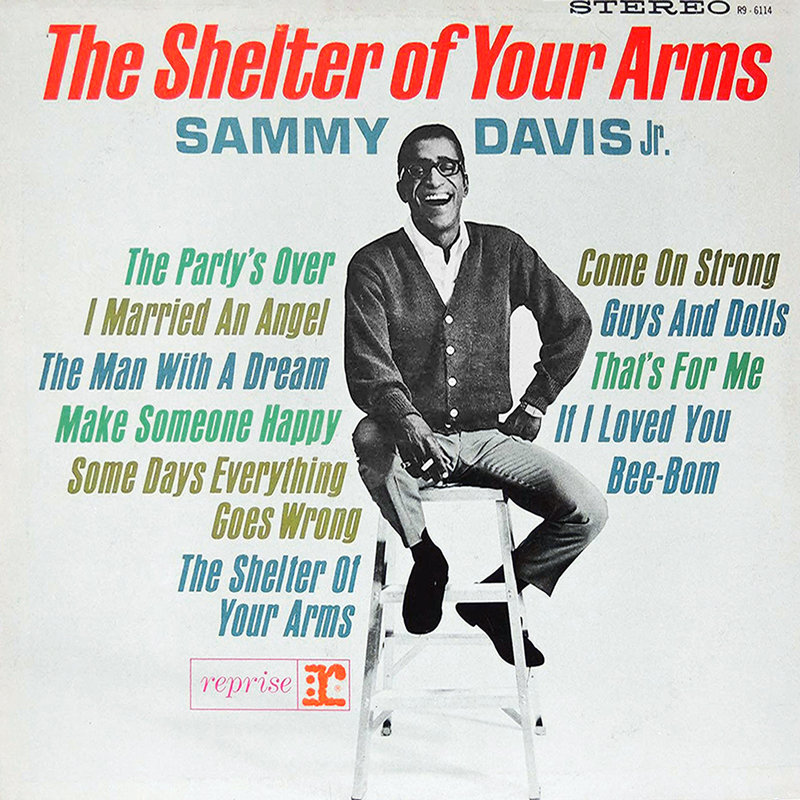 “The Shelter Of Your Arms” became the second Billboard Top 20 hit Sammy had with Reprise (his first being “What Kind Of Fool Am I” in 1962), and his third, “I’ve Gotta Be Me”, wouldn’t arrive for another half-decade. The success of its eponymous single no doubt commercially assisted this album, which was released mid-February, and reached as high as #26 on the Billboard LP charts. Beyond the title track, all but one (“Some Days Everything Goes Wrong”) of the remaining inclusions had been recorded quite some time ago, back in 1961 and 1962, and hence most were Marty Paich arrangements. 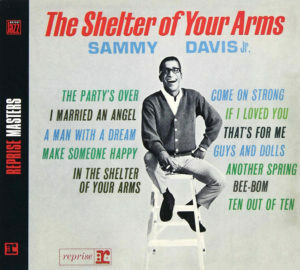 The Carousel showstopper “If I Loved You” and Sammy’s frenetic “I Married An Angel” had already been released on Belts The Best Of Broadway and All-Star Spectacular respectively, and the swinging “Bee-Bom” had appeared on the LP Johnny Cool – Original Motion Picture Score (Sammy had a small role in the film and sang two songs). The remaining six tracks (all of which originally hail from stage or film) had, for whatever reason, been left off previous Davis releases. Happily, they work well together in this collection thanks to Paich’s ingenious musical ear and Sammy’s mostly straightforward delivery. This album would finish as Sammy Davis, Jr.’s third-most successful LP at Reprise, and justifiably so. Make Someone Happy: A beautiful rendition of the only song from the 1960 musical Do Re Mi to become a bona fide standard (music by Jule Styne with lyrics by Betty Comden and Adolph Green). Marty Paich’s rich Dek-Tette sound plays nicely with Sammy’s relatively low-key delivery to make this a winner. The Party’s Over: A second Styne/Comden/Green number, this time from the 1956 musical Bells Are Ringing. Sammy is in top form here – bringing the right degree of wistful sadness to the ballad. There is a quiet sophistication to Marty Paich’s string arrangement that perfectly complements proceedings. A Man With A Dream: 1955’s Seventh Heaven, a musical adaption of Austin Strong’s long-running stage-play, starred Gloria DeHaven, Ricardo Montalban and Bea Arthur: what could go wrong? 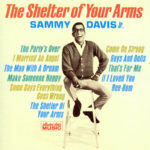 Sammy Davis, Jr. recorded one of its supposed best numbers for Decca and released it as a single. But, alas, the show lasted just 44 performances on Broadway. 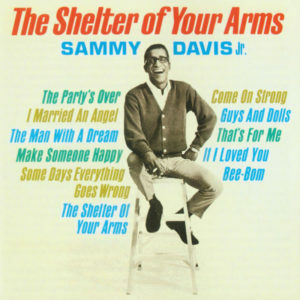 Somehow, the song must have stuck with Sammy though – perhaps the song’s message appealed – and seven years later he was in the recording booth giving it another go for Reprise! 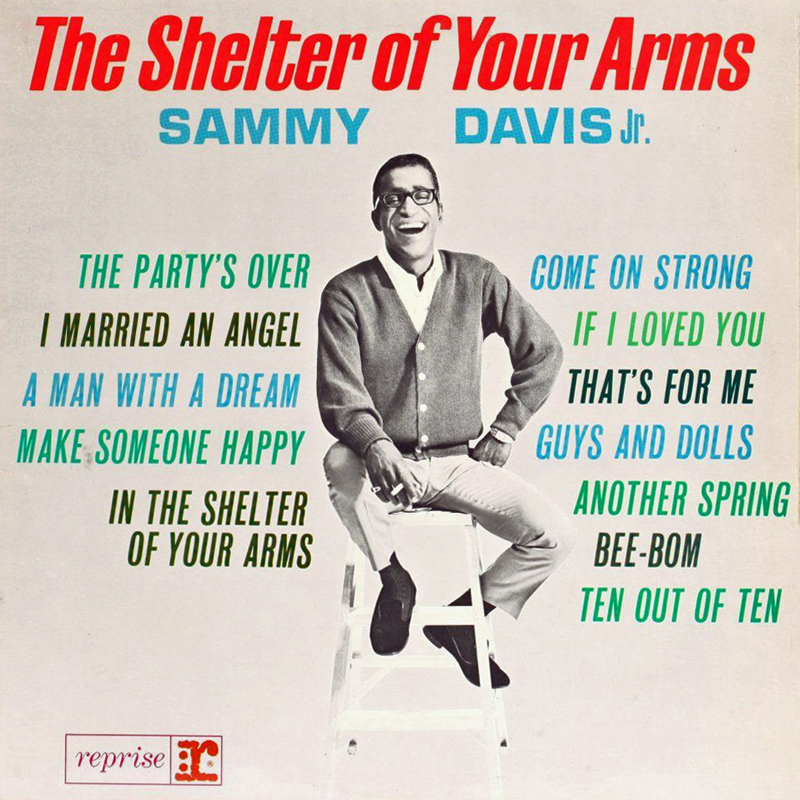 Come On Strong: If “A Man With A Dream” wasn’t obscure enough, Sammy also included this number, the title song of a stage play by the same name which survived all of 36 performances in October 1962. By the time Sammy got around to recording it – the show had closed! You can tell from its swinging style, tongue-in-cheek lyrics and artful rhymes that the song is the work of the Rat Pack’s favourite song-writing duo, Sammy Cahn and James Van Heusen. Come On Strong was producer Hillard Elkins’ first attempt at a Broadway show; his second was a hit: Golden Boy. When The Shelter of Your Arms was released in the U.K. later in 1964, “Some Days Everything Goes Wrong” was left off and two additional songs recorded in April were included in its stead: “Another Spring” and “Ten Out Of Ten”. Both songs were written by Leslie Bricusse and the arranger and conductor for both was Englishman Peter Knight (who had worked on Salutes The Stars of The London Palladium). 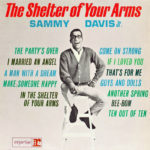 The two titles would appear in the U.S. on Davis’s 1965 LP If I Ruled The World. This album received official reissues, by Collector’s Choice in the US and by Warner Jazz in the UK. It is also readily available for download and on streaming platforms. U.K. release (from its British partner, Pye Records) featuring a different track list and hence different cover art listing different songs. Official reissue. Excellent liner notes from James Ritz. CCM logo replaced the Reprise logo on cover and the background was given a yellow-is hue. Part of their “Reprise Masters” series, this is an excellent release of the original album, with liner notes by Keith Shadwick. Curiously, they used the U.K. cover art but U.S. track listing, which means two songs are listed on the cover that aren’t on the CD. Available for download and streaming.